Funded in FY2011 through the National Fish Habitat Action Plan. This project, led by the Great Works Regional Land Trust, is located in South Berwick, ME. 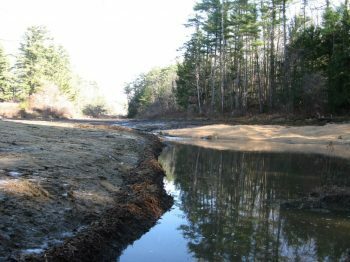 The Land Trust worked with partners to restore approximately 800 feet of habitat for diadromous fish species and enhanced approximately 4.3 miles of habitat in Shorey’s Brook. A partially‐breached dam was completely removed and the stream bed was restored to its approximate original condition. A failing perched culvert was restored with an open‐arch culvert. Text and photos provided by the Great Works Regional Land Trust.